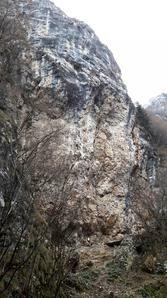 On the left side of the stream it is noted for its reddish color and for the overhanging cliff. Ideal in rainy days thanks to the huge overhangs that shelter it. The wall offers further possibilities for new itineraries of more continuity shots on overhangs and plaques. Technique of movement on the plates, athletics on cracks and overhangs where the greatest difficulty is in the continuity and the consequent rolling of the arms. Access: From the state road of Valseriana follow forClusone and then Castione della Presolana; from the center of Castione, take the road to Rusio on the left and park just before the village on the right (opposite a carpenter's shop). Continue walking on the road and shortly after about 100 meters take the dirt trail on the left (indication Rino Olmo), first uphill, then flat up to a fork. From here take a bridge on the right that leads to the stream where there is the real mouth of the valley. After a few meters you reach a Roman bridge. Continuing along the wide path you cross the river again and on the left you can see the red and overhanging structure of the Red Gym which can be reached by following the trail in the woods. Gear: It was bolted in 1984 by G. Savodelli and GM Colombo, after which the first 10 mm fix shots were made. Another way was nailed to the wall by G. Tomasoni with resinated pegs. Rock: Reddish limestone that leaves a little 'puzzled at first glance but instead very compact with holes in fissures and overhangs.